So as you probably all predicted when I announced this project, I have quickly fallen behind. I was supposed to do a little more than 8 letters in September, and I only did 5. And let’s not discuss how many I’ve done this month. Luckily, I’m signed up for a few lettering classes on Skillshare, so I’m hoping that will give me an extra kick in the pants. 01 || Kicking off this exercise with an Arrested Development themed doodle for my baby bro. 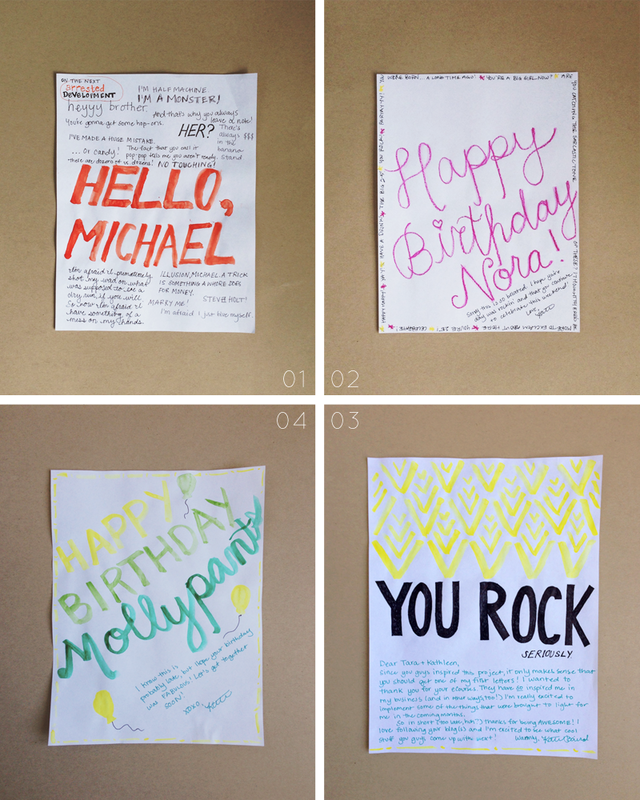 02 || A birthday note for a college roomie. 03 || A love letter for the ladies who inspired this project. 04 || A birthday doodle for another college roomie. Fall was a time for funfetti cake in my college apartment. Can I have an honest blogger moment? These pictures did not turn out like I hoped they would. While I’m usually a stickler for consistency, I hope I can improve them moving forward. But I also at this point will just be happy to have more letters to post because I have been a giant slacker on this front. Initially I got a lot of interest from other people wanting to participate in lettered letters, and honestly what took me so long to get this first post up is that I’m still trying to figure out how to connect people. If you’d be interested in participating and have ideas, leave them in the comments! For now, use the #letteredletters hashtag on Instagram and Twitter! This is such a lovely project! Definitely don’t beat yourself up on not doing enough, because really 4 letters is more than most people send in a year. Or two years. As for connecting others, I love the idea of just keeping it simple and using a hashtag. I recently participated (or attempted to) in a letter exchange where you got paired up with someone by random and we were supposed to e-mail back and forth and then send each other letters, but we both got kind of flakey and never followed through on the letter sending. But maybe that’s just me, and it could work for others? Good luck! I’m slacking too! I’ve only done five (I think). I need to set aside time for myself to work on it. Could you possibly do a link-up for people participating? I don’t know about the mechanics of how those work (I only know how to join them), but maybe if you had a scheduled monthly link-up for it then it might be a way to hold you accountable to meeting your goals for the project. I *should* be participating in this awesome project! I moved across the country after college, and left most of my closest friends in California. I can’t think of a better way to remind them of how important they are to me than sending them lovely hand-lettered letters. Plus it’s a great excuse to keep the creative juices flowing on my end, and to get in the practice of expressing gratitude regularly. Love this and want to participate! I think I’ll start mine November 1st! The hashtag is awesome but I also love the idea of a link up! !